Stephen Groo, age 40, has made over 200 films in the past twenty years crossing a broad range of genres from fantasy to romance to sci- thriller. Groo is a true American Do-it-Yourself film auteur. His eccentric style has gained him a loyal Hollywood fan base including Jared Hess (director, Napoleon Dynamite & Nacho Libre), Jack Black, Jemaine Clement, and Mike White. Along with that has come a large crowd of trolls and haters. Groo has been largely unemployed during the past 12 years because of his obsession with making films. He and his wife, Sherry, and their four kids survive solely on Sherry’s $1,000 per month income. Groo has never made a profit on any of his 180 flms, but he’s determined to go for broke (again) and give it one last shot to produce his original elf/human love story lm, The Unexpected Race and see if he can finally make it as a film director. 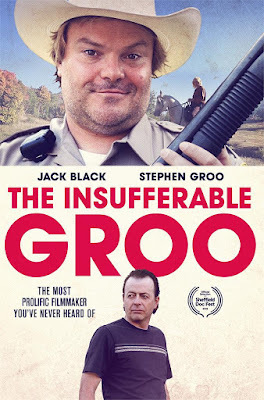 The film follows Groo as he tries to woo and cast Jack Black as the sheriff in his film with no permits, little money, and volunteer actors, Groo’s yearlong production encoun- ters problems that threaten to shut it down daily. SCOTT CHRISTOPHERSON was one of ten documentary filmmakers featured in Variety Magazine’s “Docu-makers to Watch” list in 2015. Scott’s debut feature film, Peace Officer, won both the Grand Jury and Audience Awards for best documentary at the SXSW Film Festival. Scott’s films have played at Hot Docs, Full Frame, Sheffield, DOC NYC, Montclair, Camden, Traverse City, New Zealand International, Melbourne International and Taiwan film festivals. "THE INSUFFERABLE GROO" is Executive Produced by Roger Fields, Sam Adair, Wade Hollingshaus, Carter Nelson. Produced by Jared Harris, Eric Robertson and Scott Christopherson. Cinematography by Tim Irwin, Jack Allred and Scott Christopherson. Edited by Renny McCauley and Music by Eric Robertson.